4 - 56 channel rugged chassis AE system containing the PCI/DSP-4 cards. Ideal for research and applications where high speed, low noise, varied testing purposes and large number of channels are required. The DiSP-56 AE Workstation, houses an entire acoustic emission system including up to 56-Channels (14 PCI/DSP-4 AE Subsystem boards) of simultaneous feature/waveform based AE channels, 56 Hit LED’s on the front panel, fully integrated and digitally controlled, high fidelity, AE audio monitor, powerful, integral PCI-bus based computer and all standard PC computer peripherals (such as floppy, hard disk, CD-RW drive, serial and parallel interface ports). The DiSP-56 is a heavy duty, industrial, desktop (or rack mountable) chassis with high capacity cooling and ventilation for reliable day-to-day operation. The system is 17.5" (445 mm) Wide, 10.5" (267 mm) High and 19.0" (483 mm) Deep and weighs 58 lbs. (26.5 Kg) with 56 channels. The DiSP-56 comes complete with external Video CRT monitor, keyboard and mouse. System communications capabilities include; built-in Ethernet 10/100 LAN, and optional AE system expansion interface for connecting multiple DiSP’s to one AE test. The optional "PAC AE System Viewer" software provides the ability for remote control over the company network. The DiSP-56T, "All-in-one" chassis, consists of a standard DiSP-56 rack mount chassis integrated inside a rugged transit case that also contains a flat screen LCD display, printer, keyboard, mouse and all wiring pre-connected to the DiSP-56 so that all one has to do to operate the system is to connect the AC line cord and sensors, power-up, and begin testing. Using the DiSP-56T transit case, results in lower shipping costs, excellent system protection during transportation and very fast AE test set-up times. The DiSP-56T All-in-one transit case is a 7U, rack mountable transit case with internal shock mounts to protect the internal DiSP-56, and removable front and rear panels. 6U of the case height holds the DiSP-56 channel chassis and 1U holds a keyboard/mouse drawer. The front cover is hinged at the top and contains an integral 14" flat screen LCD, CRT monitor, with SVGA resolution. The rear panel contains a rugged bubble jet printer. 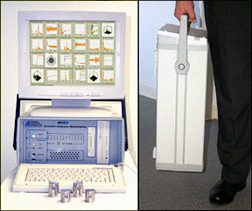 Overall dimensions of the DiSP-56 Transit case is 32.3" (82 cm) Long, by 21" (53.3 cm) Wide by 15.5" (39.3 cm) High with a total system weight of 123 lbs. (56 kg) complete with DiSP and 56 channels.